Regardless of your reasons, we used data points from MBAs like you to uncover the best companies for work-life balance, based on hours worked per week, how often employees traveled, and employee ratings on firm-wide work-life balance. Take a look at the list below, and read more on our methodology at the end. 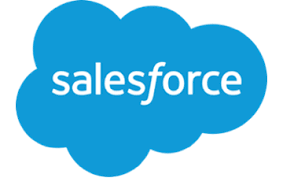 The San Francisco cloud computing company employs over 25,000 people worldwide. The firm generates revenue from its flagship CRM product, as well as through its strategic acquisitions. The company hires MBAs primarily for product marketing roles. WayFair is the largest online home furniture retailer in the United States, with a revenue of $2.25 bn in 2015. The company IPO’d in 2014, raising over $300 million, and is headquartered in Boston. MBAs report being hired into general management roles, among others. Read more about Wayfair’s stylish offices here. Founded in our hometown of Chicago over 100 years ago, Walgreens is the second largest pharmacy chain in the United States. Expect big changes to the company soon, as Walgreens is nearing the closing of a deal to acquire Rite-Aid, the third largest pharmacy chain. Walgreens has hired MBAs in finance, strategy, and analytics functions. 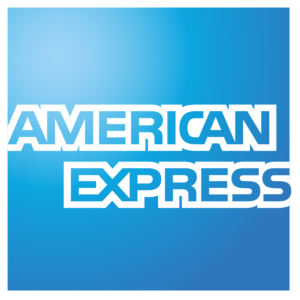 A popular credit card in the United States, American Express accounted for 23% of credit card transaction volume in 2016. Already touted as a great firm for work-life balance, American Express is also bolstering its benefits package, providing employees with better leave for parents. Strategy and finance are the primary draws for incoming MBAs at AmEx. The Nike umbrella of brands, which also includes popular labels Hurley and Converse, is based in Beaverton, Oregon and employs over 44,000 people worldwide. 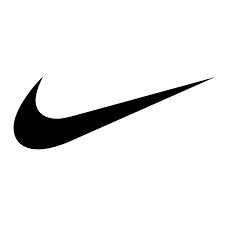 One of the largest sports business brands in the world, the company pulled in $30 bn in revenue in 2015. Roles available span supply chain, finance, operations, and analytics. Based in Boston, Liberty Mutual is the fourth largest insurer in the US. Not only limited to US operations, the company also has operations in 18 other countries, including China, Brazil, and the UK. The firm hires MBAs into its corporate development and corporate strategy teams. 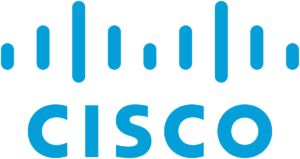 The largest networking company in the world, Cisco offers a variety of services and hardware. The company is based in San Jose, California, and employs over 70,000 people worldwide. MBA hiring spans a breadth of roles including product management, corporate strategy, and product marketing. Ecolab builds and sells technology pertaining to food, water, and energy with services to a variety of industries, including food and healthcare. The St.Paul based company’s revenue exceeded $14 bn in 2014, and employs 47,000 people. Roles reported by graduating MBAs include finance, marketing, and HR. 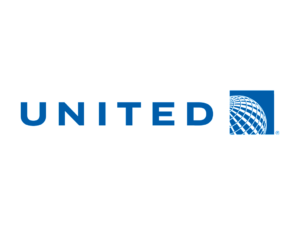 Based in Chicago, United is the world’s third largest airline after American and Delta. The airline has consistently received strong ratings from MBA employees for strong compensation and benefits. Most MBAs reported working in analyst or finance capacities after graduation. Rounding out our list is Discover, the third largest credit card brand in the US. Based in Riverwoods, IL, Discover has nearly 50 million cardholders. The company has been featured in publications recently for its benefits, including onsite dry cleaning, recreation areas to stay physically active, and flexible schedules for their employees. The company hires MBAs primarily for marketing and its Strategic Leadership Program, a training-intensive, entrepreneurial 2-year rotation within its fast-growing consumer banking arm. Using crowdsourced, verified data only from the TransparentCareer database, we took information such as amount of hours worked and travel percentages as reported by our users to curate this data. We only used companies where we have a high amount of data in order to account for any outliers. Hours Worked: We indexed each value in our database, and gave higher scores to companies that reported lower hours worked each week. Travel %: The amount of time our users reported having to travel for work, on average. 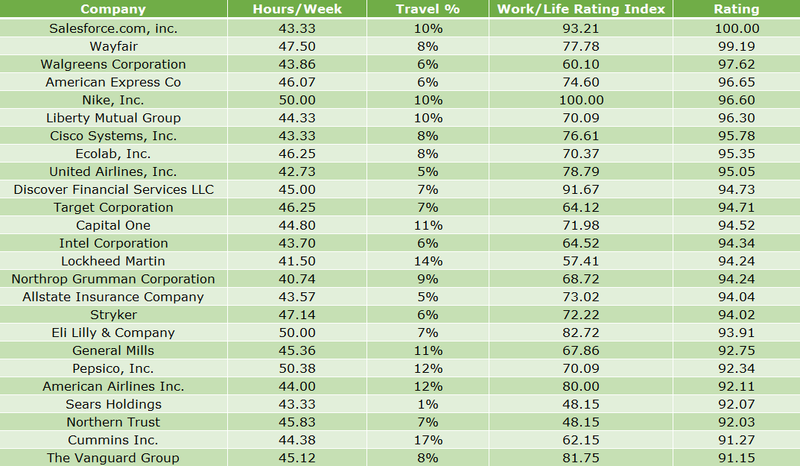 Work/Life Rating: Ratings on a scale of 1-10 of firm-wide emphasis on work-life balance, as reported by employees. What do you look for in a company when looking for a new job? Questions or comments? Reach out. Looking for more career focused data? Sign up for a free TransparentCareer account and get free data on compensation, work/life balance, and more.